A little needed diversion maybe. This is a project I've been working on for a little while - the intention was to produce a set of consistent tiles that we could use on a "fleet" page for the website, but also for race announcements and in the client. 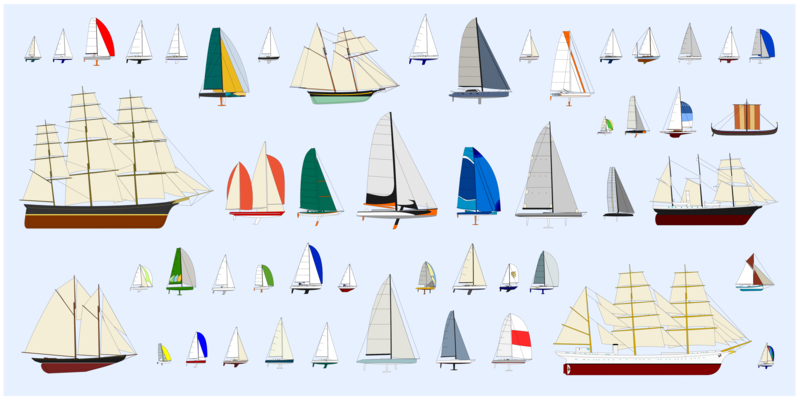 The boats are all individual files matching our polars, and are scaleable vector graphics - easy to manipulate. I've made up an "entry form" over at 76Trombones.wordpress.com and can host a larger file there. I invite anyone interested to test their sail ID and google-fu. I figure the max score is currently about 111. Once it's finalised I'll publish the vector-art version. Maybe we can have some posters made up? Oh wow 76T that is wonderful - I have been so wanting to make a boat name + polar + image + list of races for so long. I try and keep up to date a note of all boats used in races (in a spreadsheet), and polars are nearly all uploaded as image files anyway now they are included in race descriptions, so the only thing missing has been an image (with scale maybe)of what each boat looks like. I had been thinking of trying to find copyright-free images from the internet, but your diagrammatic images would be perfect!!! At the moment the SOL Boathouse is a bit barebones!! Here's an example tile - we should be able to handle line thicknesses, scale, etc in code, so one file for each boat can serve many uses. Lol... I should have at least changed the filename huh? Bernd leads by (with?) 1 point! I didn't remembered the boat type and I didn't saw the file name. But I know Flo from many pics and it's so unusual at SOL. I've done it. To be correct: I tried it. In the 4th row I lost the connection to the pics. There were only 4 or 5 columns listed in the test but there're more boats. It would be easier when there will be number/letter at each boat. the waterlines! ok, forget my results, next try tomorrow. And thanks for the big picture.